It’s taken a week and a cathartic dinner party with good friends to come around to writing this post. But believe it or not, it was going to be the next Reason For Not Eating Out even before the election one week ago. The stress of not knowing how that was going to go was almost too much to bear doing anything besides cooking, you see. As a culture, we’ve deemed “chicken soup” a metaphor for comfort. “Chicken soup for the” fill-in-the-blank is a well-known adage popularized by self-help books and whatnot. Now, I am very sure that there are very many restaurants serving sublimely comforting chicken soups. But I don’t think that’s what we typically conjure when using this term. 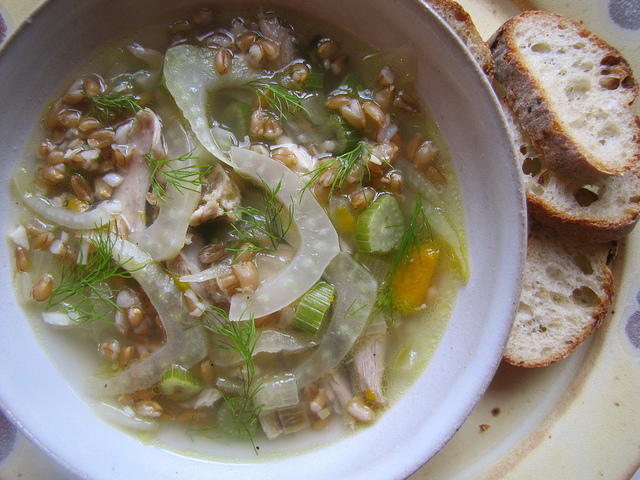 We mean the soothing comfort of home-cooked food (pictured above: Chicken Soup with Fennel & Farro). The most visceral early food memories I have include the smell of chicken stewing in a home kitchen’s pot. 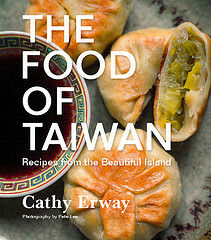 Whether it was my mother’s red-cooked chicken stews, with dark soy sauce-stained eggs and plumped sponges of shiitakes bobbing to the surface; or my next-door neighbors the Kieslowski’s chicken paprikash wafting into my backyard; or my childhood best friend Julie Stein’s mom’s matzoh ball soup simmering in the kitchen while we played upstairs, I know that smell of homemade chicken soup (or stew). I am sure you do in some way, flavor or form, too. It’s very comforting indeed. But you don’t get to smell that pot bubbling for hours when you’re in a restaurant—and I think that’s a big part of its comfort. So when I was stressed over the last few weeks, following the rampant, increasingly urgent and infuriating headlines heading into the November 8th election—and who wasn’t, it seemed?—I found a lot of solace in sticking my head down in menial tasks like cooking. And bubbling great pots of something on the stove. To be sure, I did some phone-banking for Hillary before the election, but I could have done more. And I think a great deal of people are in this position of feeling like they coulda, shoulda, woulda done more to have their voice heard before the election—if judging only by the ongoing riots across the country at Trump buildings. When you feel powerless to make something right, make something positive, or just make change at all, you still can have this: cooking something nourishing and delicious. It’s all in your control. You can choose only the best ingredients, and not have to wonder where they came from as much as you would if you were in a restaurant. You can burn the garlic, spill the rice all over the floor, add too much of something—but it’s all yours. You can own it. If you focus on it, chances are you’ll make a wonderful chicken soup, or spaghetti with meatballs, or seven-course salmon-themed dinner for ten friends. And you can make a positive impact on yourself and others. It’s productive and soothing. It’s more positive than rioting, I think. So that’s something to do in times of great stress. Other things moving forward might not be so simple. But here are 6 easy, proactive ways that you can make an actual impact on the food system without seeming to do very much at all. Buy responsibly-raised meats and seafood. Buy local, in-season produce from a farmers market or CSA. Support an organization that promotes the above, whether it be a restaurant, a non-profit, a publication, or a store. Sign a petition urging for testing of glysophate, a potentially harmful chemical pesticide that’s found in a lot of food. Be informed. Stay abreast of food issues. Talk about it with your friends over dinner. Talk about it over social media. You might have more friends of like mind than you thought. Be active. Be positive. Do things, like cooking dinner. Get the energy to do more.